If you are looking for a great, affordable carpet cleaning company in Langhorne, PA, you will want to find a local company with great customer reviews. You’ll want a company with years of experience and certified technicians. You’ll want a company with competitive prices and a satisfaction guarantee. Well, OxiGreen in Langhorne, PA certainly fits the bill! We are a locally owned and operated company that has served Langhorne, PA and surrounding areas for the past 25 years. Our customer reviews, which you can read on our website, are outstanding. All of our carpet cleaning technicians are certified by the Institute of Inspection, Cleaning and Restoration Certification, and independent agency that trains and monitors carpet cleaning technicians throughout the United States. We are happy to offer all of our residential and commercial customers a 100% satisfaction guarantee. If you are not completely satisfied with our professional cleaning service, we will come back out and make it right…for free! Not only that, but we are a 100% green carpet cleaning company. All of the cleaning agents used in our long lasting, deep cleaning process are chemical free. They will not harm the fibers of your carpets or, more importantly, the health of your family. We will never leave behind a speck of toxic residue that will affect the air quality in your home or business. 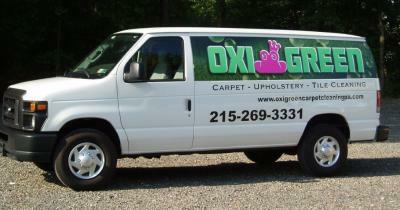 For a great, affordable carpet cleaning experience, call OxiGreen in Langhorne, PA at 215-269-3331. Our friendly and helpful customer service reps are standing by to answer your questions and schedule a free, in home carpet inspection for you. You may also visit our website to read those customer reviews and learn more about our other interior cleaning services, including tile and grout cleaning and more. Call OxiGreen in Langhorne, PA today. You’ll be glad you did!